June 26 2010 will make 6 years since the loss of our son Billy, who crossed over to heaven on that day. I will touch on my own personal from that day to today. The loss of a child no matter what age they are at their time of passing, is the most devastating feeling that any parent could ever go through. It is the most heartbreaking, life draining, painful, mind numbing and so on……….. feelings that anyone could ever go through. But I can tell you that, as a father who has suffered that experience myself and as difficult as it is to go through, life will get better. You will start to have more good days than bad days, it may seem impossible but you will get there, one day at a time, but you will have to do your part by moving forward. I can tell you from the many emails that we have received over the years, that there is no set time or way of going through your grief because everyone is different. The important thing is to always try to keep moving forward and living your life to the fullest. One of the ways that received help was with a meeting with spirit messenger Vicki Monroe who helped us when she was able to connect with our son Billy in heaven. Vicki’s message from Billy was amazing and very uplifting which also helped me to create our website www.oursonbilly.com which also helped me as a healing tool and by the many emails that we have received, it is also helping others. It took about two years, give or take for me to really start living my life again. everyone is welcome to visit our website and read or story and of the amazing events, ( signs from Billy in heaven ) which began to occur to us. 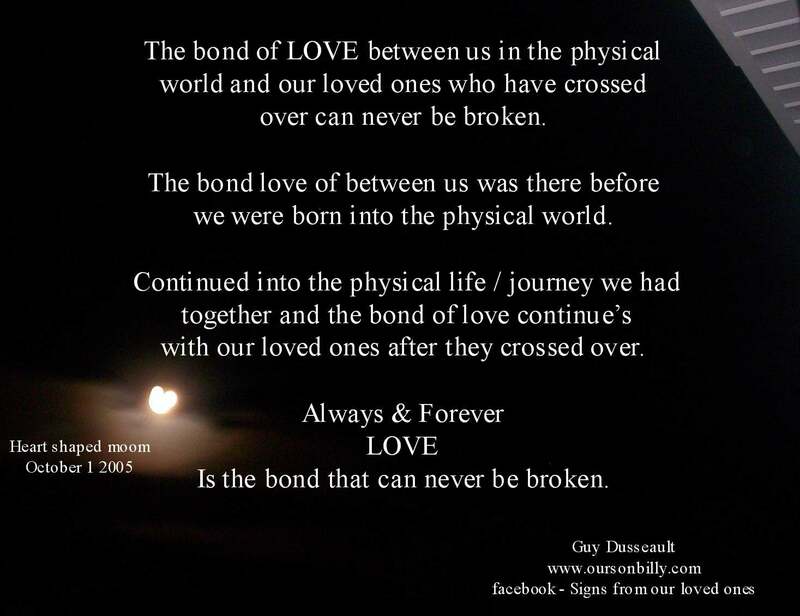 I can tell you that our loved ones when they cross over to heaven only have pure love for us and that they are closer to us then they were while in their physical form. They want the very best for us to keep moving forward and to live our lives to the fullest. They are always near by they know how we are feeling and when we are thinking about them and that when it is our time to cross over to heaven they will be there to greet us. For anyone who needs help dealing with their loss, it’s good to seek help from those who can help you whether it’s family, friend, a counselor or someone who you know who has gone through a loss to talk too. 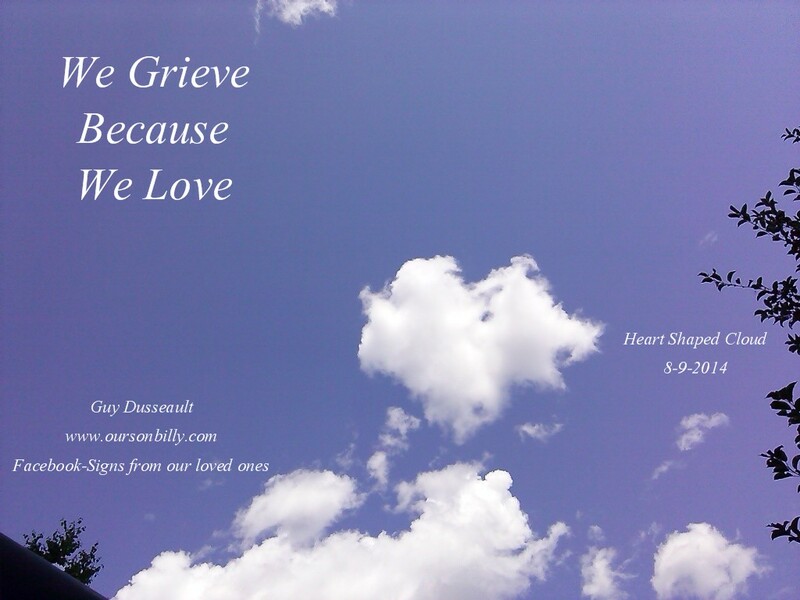 There are many websites that also forums for anyone who has suffered a loss of a loved one where you can share your grief with others and read comments and articles by people who have gone through a loss. Two of these type’s of websites are www.webhealing.com and www.legacy.com others are www.opentohope.com and www.mygriefspace.net . There are places like www.virtualmemorials.com a place that you can set up very easily a webpage on their website in honor of your loved one, which others can read and talk about their grief and recovery. And of course another helpful way is through a spirit medium, that helped me and I know of many others who have been help deal with their loss through a medium, just make sure that the medium you are seeing is the real deal, like a Vicki Monroe, www.vickimonroe.com . 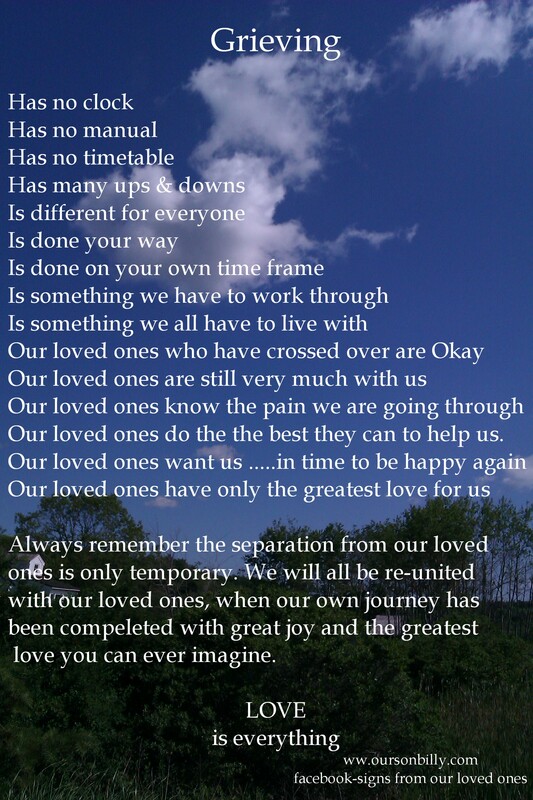 I hope this can be of help to all of those who have suffered a loss in some way and remember, take it one day at a time and always try to keep moving forward. Your more than welcome to send us an email at any time at info@oursonbilly.com .